This past week was Passover, which started on Monday night. We always enjoy Passover with a few of our friends, with each of us trading off for who hosts the Seder, this year we did the hosting and it was a lovely party! 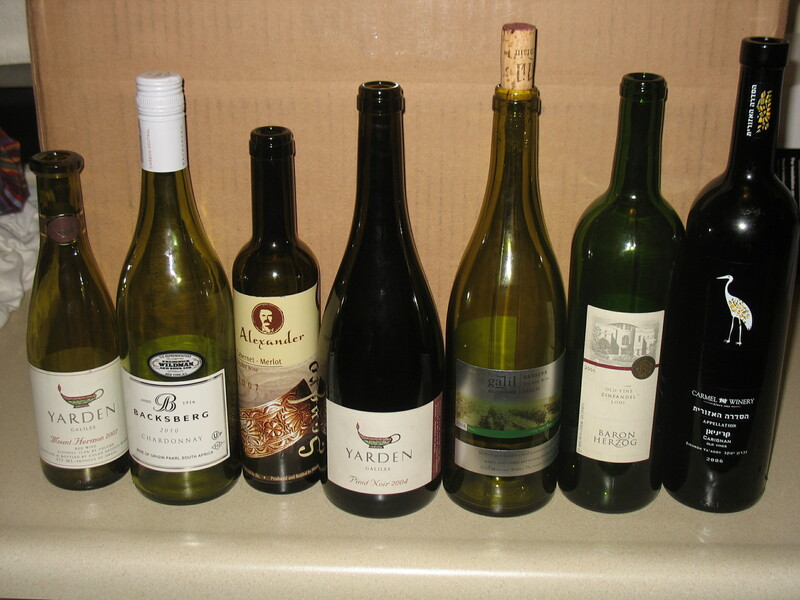 We opened some wines, some nice, some OK, and some close to being duds. In the end it was a true joy and was enjoyed by all who attended, at least that is what they told me 🙂 We started the Seder off with some nice wines, listed below, and then moved on to whole-wheat hand shmurah Matzoh! This was the first year that we were lucky to get our hands on whole-wheat hand shmurah matzoh. It is very easy to get whole-wheat, spelt, or other cool versions of the five grains matzoh. However, this is the first year that I could easily get our hands on whole-wheat hand shmurah matzoh. The matzoh was thin and lovely but a bit stale, so we had to reheat the matzoh for 10 or so minutes in the oven to revive them and get them nice and crispy. After that we had some lovely herb encrusted Gefilte fish loaf along with eggplant, onion, and mushroom salad. For the main course we had some lovely meatballs, kugel, quinoa, and a fresh green salad. Now before you call me a heretic, yes I eat Quinoa on Passover, as does the CRC and the Star-K, while the OU has backed away from this whole mess and let people decide for themselves. We have been eating Quinoa for sometime on Passover and though others have an issue, we feel fine about it, though it is best to contact your own local area Rabbi. The New York Times heard about the tumult and wrote an article all about it. Heat the olive oil in a large pot. Add the onions and sauté over a high flame stirring constantly until soft. Add the tomato sauce and parsley and continue to cook for three minutes. Remove the onions from the heat and set aside and cool. Once cool, add all of the ingredients to a large bowl and mix thoroughly by hand and roll the meatballs into golf ball sized meatballs. Now we need to create the braising sauce. Chop the two onions and saute them in the olive oil. Once browned nicely throw in the tomato sauce and wait for the sauce to thicken by a quarter. Then add in the wine and mix thoroughly. Then add in the meatballs one at a time into the hot braising sauce and cook the meatballs for 20 to 30 minutes. The funny thing about the Early Show recipe was that it had liver in it, which is not for me. Also, they were roasting the meatballs and that is a no-no for the first two nights, as one cannot eat any type of roasted meat for the first two nights of passover, as it may look like the Passover Sacrifice which we do not have today. Yes, meatballs do NOT look like a sacrifice! Still, the law is: any meat braised is fine, any meat roasted (cooked without a sauce) is NOT. You can eat roasted vegetables. This wine is really hitting its stride and may well be time to drink up! The nose on this dark garnet colored wine opened with black fruit that lays deep within this wine’s veins, but hidden initially under a blanket of oak. This wine opens with sweet oak, blackberry, raspberry, plum, and classic Pinot cherries along with coffee, dirt, and a hint of herbaceous mint. The mouth on this full bodied wine was velvety and mouth coating. The tannins are now well integrated and not mouth puckering and give a richness to the wine. The mouth starts with blackberry, raspberry, plum, and cherry, and flows into a mid palate of more oak, coffee, dirt, and some middling acidity. The finish is long with rich fruit, oak, chocolate, vanilla, and a bit of chocolate that rounds out the wine. This is a nice wine that is showing well but is time to drink up!!! Our story begins in 2003 and bombs are exploding up and down the state. Residents are worried to leave the house, and the wine industry is taking a severe hit, as overall morale is down. As the state steps up, and brings its considerable weight to bear on the problem, private individuals start to wonder how to remove the malaise from among the populace. Up steps Avi Ben, an owner of a successful chain of wine stores, who comes up with an idea to kill two birds with one stone. So Avi sat down with a few local wine marketers, and organized the first Jerusalem Wine festival. In his own words, as described by Jerusalemite.net – We decided to organize a fair that would bring wine distributors to Jerusalem. We picked a great location, the Israel Museum, and once they agreed to house the festival, all the planning became easier. People loved the location, they loved the idea, and it was a huge success. Under this backdrop, my friend and I were more than happy to attend the 6th annual Jerusalem Wine festival, which was once again located in the Israel Museum, Jerusalem. As we gave our tickets to the attendant (previously bought at the Nahalat Shiva Avi Ben store for 60 NIS) and slowly walked our way to the sculpture garden in the back, we could already take in the night’s air. It was filled with the smell of olive trees, pine trees, open wine bottles, and the initial sense of excitement. As we got closer to the open air arena, that hosts the 33 wineries that were presenting their wares for the evening, we were greeted by a table of glasses. The glass was ours to use during the evening, one that would be our ever present partner to the evening’s soiree, and one that we could take home after the long evening. I paused at the opening to the garden, and took in the spectacle that was in front of me. Beyond the dim lights, the 33 wineries that rimmed the garden and the center as well, essentially creating a pair of concentric circles, what was evident was the lightness of the evening. This was not going to be a wine snob event, or an event that would require heavy wine talk. Instead it was a casual affair, accentuated by the dress code of many of the attendees – shorts, tee shirt, and flip flops. But even more evident was the electricity, the life, the joy (even if alcohol fueled), that powered the evening and lit up the night’s sky. It was almost ethereal yet real, and one of the most exciting aspects of the evening. Shmitta wines for those of us who live in the Diaspora. The 2008 vintage is a shmitta year, and many of the wineries use a loophole called heter mechira, where they sell the grapes to non-jews. This is a not so accepted practice in the modern era, and so most Orthodox Jews do not drink those wines. The only way to know is to pick up the bottle and read the back label, where things of this nature are spelled out. The wines from Yarden, Galil, and some others, use a more accepted practice called Oztar Beit Din, and so I happily enjoy Yarden and Galil wines from the 2008 vintage. As lovely as the Spieglau glasses were, they were not “toveled” – ritually immersed, which Orthodox practicing Jews do, before making use of the utensil. 99% of the wines served that night, were non-mevushal wines. Meaning they were not pasteurized, which sounds great, because why would you want to pasteurize wine for goodness sakes, this is not milk with volatile bacteria. Well, because “mevushal” wine can be handled by non Jews, while non-mevushal wines cannot be. Furthermore, if a non Jew were to touch my wine glass or bottle, I cannot drink that wine anymore. The law is not very PC to say the least and truly requires a long post to analyze it better (which I will be doing soon God willing), but my belief system is based on faith and not one that I can turn on and off when it suits me or my friends. Now, I do not bring this up to disparage the Jewish lineage of those that were pouring the wines. Rather, I bring it up because the rules around the open bottle were lax to say the least. The open bottles, from which the wine was being poured was touched by many a passerby, and of their lineage, I have no idea. My feeling is that the next time I go to this event; I would probably attend, but not drink any wines. Once we were finished taking in the scene/madness that was swirling before us, we moved our way to the booth of one of Israel’s most exciting wineries – Yatir Winery. It has captured the imagination and attention of many wine lovers including myself. I have been lucky to visit the winery twice before, and each time I am in awe of their progress and continual assault at the wine world’s malaise and opinion of Israel’s wine industry. Just this past year they were awarded one of the highest scores for their flagship wine by Robert Parker and Mark Squires of the Wine Advocate. There I had what can only be described as a brain freeze, when I tasted one of the best white wines of Israel – the 2008 Yatir Sauvignon Blanc, before I realized that the wine was produced using heter mechira. I was mistaken at that time, and once more unfortunately, and is the main reason that I did not enjoy more of the whites that evening, as they were either produced by non kosher wineries, or because they were the 2008 vintage and used heter mechira. That said the 2008 Sauvignon Blanc was wonderful, but was clearly not opened long enough to get its legs under it. Still, it showed a nice tropical fruit flavor along with a bit of cut grass and some lychee. From there we moved on to the Galil Mountain Winery‘s booth, where we were hoping to be able to taste the highly acclaimed Galil Meron. Unfortunately, it was not available for tasting till 9PM, so we were “forced” to partake of their other showings until the hour passed. I was happily distracted by the Galil Pinot Noir, which is a more classical take on a French Burgundy, than those recently produced by Israeli wineries. Still, the wine has enough facets – like its soft oak and coffee flavors to throw you off the French scent. The other two wines I tasted while waiting for the grand moment, were less than enthralling. The 2008 Galil Rose, was bland and flat, and the 2007 Galil Barbera was but a glimpse of its older brother’s power and depth. Where the others disappointing, the Galil Meron did not. It was a wine well worth the wait and one that I highly recommend for those in Israel (the US allotment will not be available till 2010, probably for Passover). We next visited the booth of Dalton Winery, where we tasted a dud of a wine and a real nice winner. The Dalton Rose, made of 100% Cabernet Sauvignon grapes was an average quaffer, with a rose petal flavored mouth and a raspberry nose. Nothing to write home about or post about. The winner was the 2007 Dalton Shiraz – WOW! A solid blockbuster of a wine and one worthy or your attention. We then weaved our way on over to the booth of the Binyamina Winery, where we took in a nice 2006 Cabernet Sauvignon Reserve. While some booths had massive and expressive signs – note the Yarden Golan Heights Winery’s sign, other small wineries had zero signage. Yarden being one of the biggest wineries in Israel had a sign to match their importance and prestige. Heck, forget the sign, they had a whole platform. The sculpture garden is lovely and expansive, but the floor is rock and dirt, which while native to Israel and Jerusalem, is a bit too native for many of the folks standing and walking around for the 4 to 5 hours that the event was open for. Yarden and another winery had a lovely platform, with soft padding, great lounge chairs, a few tables, and awesome wines (which is obvious). I cannot seem to find a picture of the platform, but take my word for it :-). Anyway, we once again weaved around and through the crowd, and moseyed on over to the booth of Tzuba Winery. We have spoken before about Tzuba, and we had the extreme pleasure of visiting their lovely winery before. They are a winery with a long lineage of managing vineyards of the Judean Hills. The wines were a nice selection of the wines available from the winery, within Israel, and yet another reason for us of the Diaspora to do Aliyah! Yes, they export some wines, but the vast majority sells fine within Israel. We enjoyed a lovely 2007 Belmont (55% Sauvignon Blanc and 45% Semillon) which showed nice dirt, lychee, grapefruit, and peach. The 2006 Tel Tzuba Merlot was also quite nice. The 2006 Tel Tzuba Cabernet was a bit off, so I did not write it up, the bottle tasted over ripe or oxidized. We were off again, and moving towards a booth with a large sign, the Tishbi Winery Booth. It was mostly a waste of a trip, this time around, except to prime the pump for a return trip later in the evening, to taste their wonderful desert wine, when my evening of tasting was done, and my evening of drinking began, but we are jumping the gun! I digress again! After the awful and overripe 2006 Tishbi Shiraz tasting, we ran into a bunch of acquaintances from Rogov’ forum. The inner circle of wine booths did not take up all the possible space, so they filled the empty space with some nice standing tables. I rolled up to the table to augment my wine notes, and as I am of to do, I struck up a conversation with the people around me. Standing there as well was Zvi and his lovely wife. He overheard the conversation I was having (which is shocking given my quiet personality), and quickly surmised that it was I that had blown him off earlier in the evening. We were supposed to meet up at the booth of Assaf Winery. Well that never happened, because we could NOT find the bloody booth! It was one of those booths that had almost no signage, and so made it a bit hard to find, given the swarms surrounding the booths. Anyway, after talking a bit, Zvi pipes up asking “did you get to taste the 2003 Magnum Yarden Merlot”? Well no I say, heck I had yet to stroll over to the booth/platform at all. Given the opportunity, I bid my adu, and head on over to the Yarden “booth”. I nicely asked for a bit of the Merlot, and was rewarded with what can only be described as a drunkard’s convention sized glass of the dark garnet gold! Keeping in the new Hebrew and non-sequitur slang the Merlot was chaval al ha zman (translated literally — it’s a waste of time” in slang — fantastic, wonderful, out of this world, great). I lingered long at the booth while I slowly enjoyed my glass of wine. The Merlot was fat yet not over ripe, red fruit, with a ton of chocolate and tobacco. It almost felt like you were drinking ripe fruit and wood, while smoking a fat cigar and inhaling boxes of dark chocolate – quite a trip to say the least – like I said – chaval al ha zman. Once I had my chance to talk with the Yarden crowd and enjoy my wine, I found my way over to the booth of Tzora Winery. We have spoken about this winery before, and have also had the pleasure of going to their lovely winery, just before the untimely passing of their founder Ronnie James. Well, the wine has not missed a beat, with the new winemaker Eran Pick. The 2006 Neve Ilan was dirty and lovely. The 2006 Shoresh was a bit lighter, but still quite enjoyable. 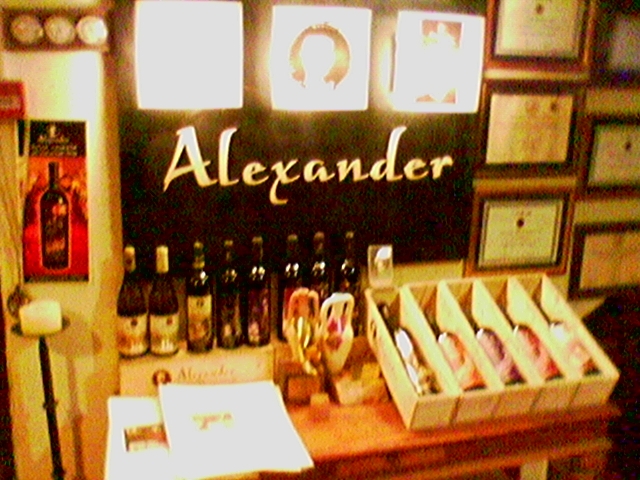 As I continued my trip around the inner circle, I hit upon Alexander Winery’s booth. The winemaker Yoram Shalom was pouring and his marketing agent was talking – quite a show! The wine that was pouring was the 2007 Sandro (named after Shalom’s brother). We were fortunate enough to meet Shalom the last time we visited his winery in Moshav Beit Yitzchak. The booth was abuzz with the recent award they won in a Spanish Wine Contest (missed the name – sorry) for their top star – 2005 Alexander The Great – Cabernet Sauvignon. The 2007 Sandro was overripe, as I have said before. The wines in the Golan and Upper Galilee can tend towards overripe flavors if not picked at the correct time. The Sandro is a blend of 70% Cabernet Sauvignon and 30% Merlot. We meandered around a bit, and we found ourselves at the Agur Winery’s booth. There I made my second faux pas, and tasted the 2008 Agur Blanca – which was also a shmitta wine and they use Heter mechira. The Blanca was really nice, though there are critics out there that do not like it as much as I did, oh well :-). I was not as impressed by the 2007 Agur Kessem (40% Cabernet Sauvignon, 30% Merlot, 20% Petit Verdot, and 10% Cabernet Franc), still a nice wine with a mix of black and red flavors, along with nice toasty oak, earth, and mouth coating tannins. My friend disappeared by now, and I was moving around alone by now. I swung by the Yarden booth again, to get a taste of the 2004 Yarden Ortal Merlot, which was stunning (I had not tasted this one before). At this point, my palate was shot and I swung by the Tishbi booth once more, to get a taste of the stunning 2006 Jonathan Tishbi Barbera-Zinfandel Fortified Dessert Wine. I absolutely loved it and it reminded me of the Carmel Vintage – which is another desert wine that is quite impressive as well. The evening ended and I picked up some wines to go, in an outside pavilion. My take away overall was that the festival was well run, while most of the wine purveyors were pushing some light weight wares that met the interest of the majority of the festival customers. There is nothing wrong with that, the average wine consumer likes their wine smooth and easy to drink. Given that trend, the wineries were pouring wines that met the consumer’s interests. The wineries that I highlighted were pouring wines that were quite enjoyable and highly unexpected (Galil and Yarden). Finally, ignoring the wines for a second, the festival’s attendees were all very amiable, courteous, and joyous. Yes they were imbibing alcohol, but alcohol can bring out the worst in people, and that was NOWHERE to be seen, and I stayed to the closing on Tuesday night. There is a lovely saying in Jewish Lore that goes something like this; When alcohol enters the person’s true self comes out. That was more than evident Tuesday night, under the full moon’s sky, the beauty that is Israel, was open for all to see and enjoy. The nose on this straw colored wine is filled with lychee, grapefruit, and tropical fruit, along with a strong sense of brightness, and almost clean steel smell. The mouth on this medium bodied wine is super bright with lychee, grapefruit, and tropical fruit, along with some nice balancing green flavors. The mid palate is bright which leads into a long and crisp finish of more tropical fruit. A really nice crisp Sauvignon Blanc with just a hint of roundness that comes from a bit of time in French barrels. The nose on this light garnet colored wine is filled with cranberry, plum, oak, and coffee. The mouth on this medium bodied wine has nice light and integrating tannins that work well with the mouth’s plum and cranberry. The mid palate is almost smooth with light tannins, coffee, and oak. The finish is long with bright acidity, coffee, and red fruit. This is not the winner that the 2006 vintage was, and may be too early to really tell where this wine is going. The nose on dark garnet to black colored wine is popping with blackberry, raspberry, ripe plum, chocolate, coffee, and rich oak. The mouth on this full bodied and complex wine has layers of blackberry, tar, coffee, and rich plum. The mid palate is layered with oak and integrating tannins that come at you in layers. The finish is super long with tar, pepper, blackberry, and chocolate. This is a real winner and one that is sure to please almost anyone at the table. The nose on this dark garnet to purple colored wine is filled with ripe fruit, plum, blackberry, tar, and pepper. The mouth on this full bodied wine with complex layers hits you often with wave after wave of blackberry, ripe plum, and cassis. The mid palate is filled with tar, oak, and coffee. The finish is long and spicy, with oak, tar, blackberry, and chocolate. Quite a nice Shiraz indeed. The nose on this dark garnet colored wine was hot out of the bottle, with ripe fruit, cranberry, blackberry, and oak. The mouth on this medium to full bodied wine has cassis and blackberry flavors. The mid palate is balanced and spicy with oak and bright acidity. The finish is bright and spicy with blackberry, coffee, and oak. The nose on this bright light straw colored wine has mineral qualities, along with lychee, grapefruit, peach, and an almost toast aroma. The mouth has very ripe flavored fruit that mingles nicely with earthy and mineral flavors, along with grapefruit and peach. The mid palate is tart and earthy. The finish is long with more tart fruit and clean mineral flavors. The nose on this dark ruby colored wine has nice earthy notes along with raspberry, cranberry, cherry, oak, and vegetal notes. The mouth is medium bodied with integrating tannins, cranberry, and raspberry. The mid palate is balanced with oak and acidity. The finish is accompanied by earth, spices, and round red fruit. This is a wine that can use more air in and out of the bottle and one that will serve you well. The nose on this black colored wine (not showing any hint of slowing down or brown), is ripe with rich red fruit, slightly hot, plum, raspberry, cassis, rich oak, and mounds of dark chocolate. The mouth on this complex and full bodied wine was throwing sediment, and comes at you with layers of with rich plum, blackberry, and chocolate. The mid palate is bright and balanced with acidity, integrating tannins, and coffee. The finish is long with tobacco, chocolate, and nice tannins. It almost felt like you were drinking ripe fruit and wood, while smoking a fat cigar and inhaling boxes of dark chocolate, quite a treat indeed. The nose on this dark garnet colored wine is filled with rich earth, blackberry, cranberry, oak, and coffee. The mouth on this medium bodied wine follows the nose with cranberry, raspberry, roasted oak flavors, and something akin to toffee. The mid palate has integrated tannins that flow into a long finish with spice, dirt, and red fruit. The nose on this dark garnet colored wine filled with plum, raspberry, earth, and toasted coffee beans, and oak. The mouth on this medium to full bodied wine is spicy with somewhat gripping tannins that have yet to integrate, plum, cassis, and raspberry. The mid palate is bright with acidity and oak, and leads into a long and earthy finish with rich oak, coffee, and nice spice. The nose on this garnet colored wine is perfumed with almost overripe fruit, toasted oak, blackberry, and raspberry. The mouth on this full bodied wine is gripping with powerful tannins, cassis and plum. The mid palate is filled with toasted oak and balancing acidity. The finish is long with cassis and plum fruit, and chocolate. The nose on this electric straw colored wine is perfumed with rich and lively grapefruit, honeydew melon, and peach. The mouth on this medium bodied wine is rich and almost glycerol and oily with ripe peach and honeydew. The mid palate is balanced with bright acidity that leads into a long and rich finish of tart fruit. The winery is tucked away at the edge of the road leading out of Moshav Beit Yitzchak – which is located in the Sharon. The winery was founded by Yoram Shalom in 1996 when his father (who had injured his hipbone) asked someone in the family to carry on the tradition he had been keeping alive his whole life. So in 1995 Yoram started to produce small quantities of wine, which his father quite liked. That gave Yoram the push to keep producing wine. Yoram was quite an accomplished producer and technician of television programs within Israel. However, in 1998, based upon the encouraging responses to his wine production – he decided to quit his day job and jumped into the wine business full time. When we called Yoram to talk about our meeting – he was excited to hear that I was also of Tunisian decent. Tunisia artwork graces all of his wines along with the label names that are all of family members. Alexander the great – is named after his father (who unfortunately passed away in 1997). The other lines are named after his sister, brother and mother. After many years of highly successful releases for his wine, Yoram decided that the 2006 year would be kosher. Most of the reds from that year, are either still in barrels or are just being bottled. Yoram hopes to release them soon. The whites have already been released and a tasting note for the Sauvignon Blanc Lisa 2006, follows below. Upon meeting Yoram you quickly see the passion that exudes out of him along with the self confidence to leave a cushy and successful career and jump into the world of wine. Upon starting the winery Yoram started learning about wine making full time and started with the vineyard managers. As the edict goes – good wine starts in the vineyard, and Yoram knows that better than most. Yoram is blessed with having some wonderful vineyards to build his winery upon. The vineyards are in Dalton Plateau at Kerem Ben Zimra and Kefar Shamay. Both are situated in the Upper Galilee and highly vaunted in their grape quality. Besides the location, the vineyards are tended to with great care and quality control is of the utmost importance. The vineyards are managed to ensure low yield production – which thereby produces grapes of higher quality and concentration. The vineyards are of great importance to Yoram. Whenever, we spoke of the wine he would always harken it back in ways to the grapes and their styling. After we finished our tasting I had a chance to talk with Yoram and Ilana – his wife who is a graphic designer by trade, and the designer of all of Alexander Valley’s labels. The issues of wine export came up a common theme among Israeli wineries – looking to expand their reach into the global market. He told us about many a story, where people upon tasting his wines, had offered him a nice business deal – of which kindly declined. Though he never spoke about it, I believe that to Yoram it is more than just about the money, it is about family and his love for the winery. I think he would happily take on a opportunity, where the exporter was looking out for the winery as much as they look out for their wallet, a tough thing to find in this global marketplace. The winery’s wine production is about 45 thousand bottles. The wines are being released in five different labels. Sandro which is a blend of Cabernet (70%), Merlot (25%), and Sauvignon Blanc. The wine is fermented at low temperature and aged in a mix of French and American oak for 14 months. Cabernet Sauvignon (aged in American and French oak for 18 months). Gaston – a blend of Merlot (76%), Syrah (12%), and Grenache (12%) which is aged in a mixture of French and American oak for 12 months. Alexander the Great the flagship wine that is made out of Cabernet Sauvignon along with a touch of Merlot (5%). The wine is aged in French and American oak for 30 months. The barrels are switched at 15 months with new barrels to maximize oak contact with the wine. Lisa – the white wine line of the winery. Chardonnay – which is fermented and then aged in Burgundy barrels for 18 months. Sauvignon Blanc which is cold fermented and co contact with wood. Bruno – a port like wine which is fortified and released every 2 years. It is made of a blend of Cabernet Sauvignon, Merlot, and Syrah grapes and aged in oak for 36 months. We want to thank Yoram, Ilana and everyone from the winery who were kind enough to host us for the tasting and after as well – until the cab showed up to take us home. Following are the tasting notes which we sampled at the winery and afterwards as well. This dark to almost purple colored wine had just finished malolactic fermentation and will be placed in new oak barrels for another 15 months. The nose on the wine is filled with dark berries, chocolate, and oak. The velvety mouth of this full bodied wine is laden with dark fruits, cassis, and blackberries. The finish is long and velvety as well with cassis, chocolate, and oak. This wine is still quite young and has yet to come into its own. This black colored wine has a story that is sad a wonderful at the same time. The grapes could not be harvested at their optimal time because of Yom Tov and Shabbos. When the grapes could finally be harvested – they were at some 30 brixs. The initial problem was finding yeast that could eat away at that much sugar – after finally finding some – Yoram had to ferment the grape juice in small batches. After essentially creating his own super yeast – he mixed them all together one more time and fermented them successfully. The wine could possibly be the first kosher Amarone – like wine. The nose is filled with an intensely concentrated aroma dates, figs, and honey. The mouth of this full bodied wine is filled with cassis, chocolate and figs. The finish is long and tannic. This young wine has a long way to go and it will be fascinating to watch its development. The nose on this light straw colored wine quite expansive. Aromas of pepper and honeysuckle and grapefruit are ever present. The mouth of this medium bodied wine is initially acidic in nature. But then it opens to a complex and crisp mouth that has strong notes of citrus and honeysuckle and finishes in a long stroll with a spicy and peppery flourish.